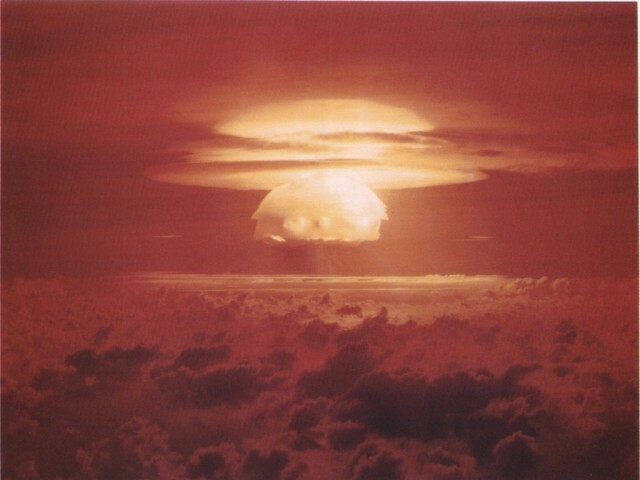 Operation Castle was a series of high yield thermonuclear weapon design tests. Following the initial experimental demonstration of the Teller-Ulam principles in Operation Ivy (the Sausage device detonated in the Ivy Mike test) both weapon labs rushed to develop a number of deliverable weaponized designs. The original schedule included a weaponized version of the cryogenic fuel system used in Sausage (designated the EC-16, the test device being named JUGHEAD); plus a variety of other extensions and new concepts. One of these new approaches - the use of non-cryogenic "dry" (lithium deuteride) fuel - was a spectacular (and disastrous) success with a yield far exceeding expectations. Some of the other tests were also much larger than expected - in fact the three largest tests ever carried out by the U.S. were all part of Operation Castle. Not all new concepts were successful, for example the first UCRL thermonuclear device fizzled. Included in the test series were experimental systems not intended for immediate deployment, weapon designs soon deployed on an emergency basis, and two designs that had already reached emergency deployment status despite never having been tested. One of these was the cryogenic TX-16, which was deleted from the test schedule (and removed from service) when solid fuel proved highly effective. An important factor in planning Castle was the availability of lithium enriched in Li-6. 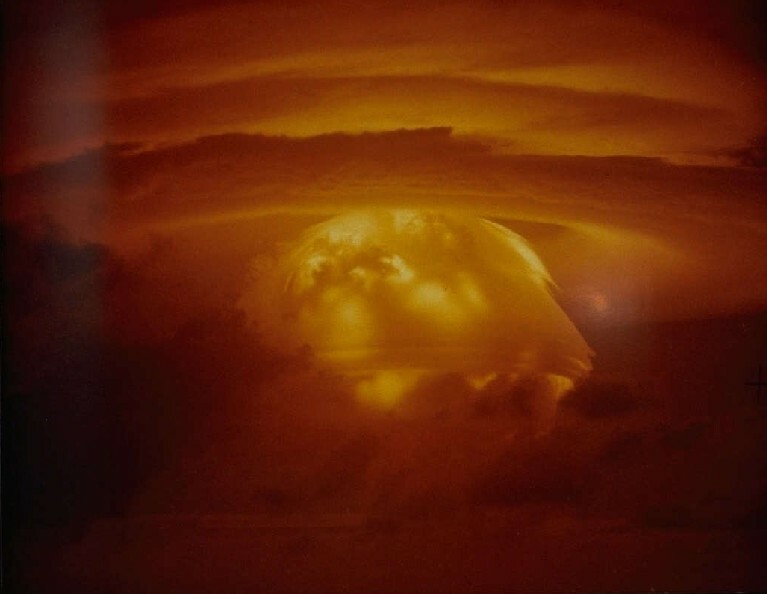 The U.S. thermonuclear weapon program had been stuck in the doldrums prior to the breakthroughs of Ulam and Teller in early 1951, and no plans had been made for producing this fusion fuel. Once a workable design for a high yield fusion weapon had been conceived though, it became a race to get a large lithium enrichment plant into production. 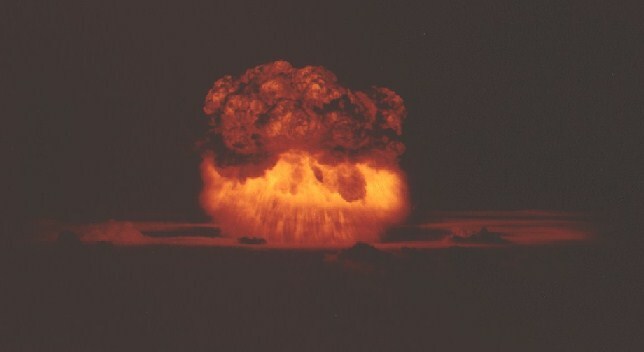 The Soviets in contrast had decided to pursue a thermonuclear design of limited potential (the Sloika/Alarm Clock), and had begun constructing lithium enrichment facilities before the United States. The Soviet Union exploded a "dry" device of this type the August preceding Castle - at the time that the first U.S. lithium enrichment plant was just starting up. Due to the current lithium-6 shortage, several weapon designs tested in Castle therefore used only partially enriched, or even unenriched lithium. 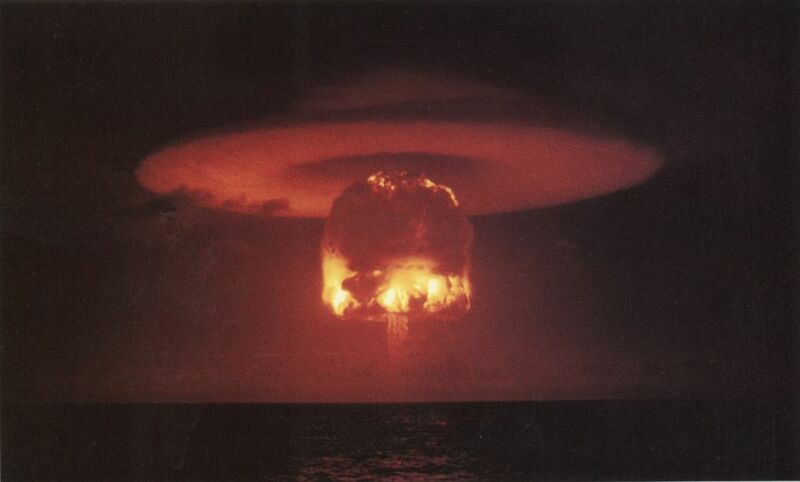 The Shrimp device tested in Bravo was a 15 Mt two stage thermonuclear surface burst. 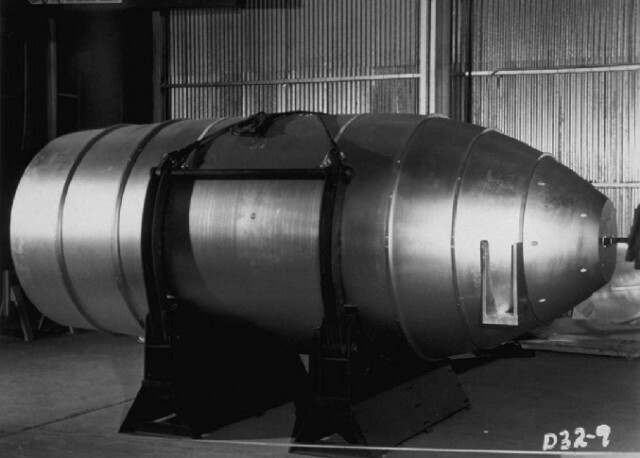 This was the first "dry" or solid fuel (lithium deuteride fueled) H-Bomb tested by the U.S., and the first solid fuel Teller-Ulam device ever tested. It was the largest bomb ever tested by the U.S. although this was by accident. The yield of Bravo dramatically exceeded predictions, being about 2.5 times higher than the best guess and almost double the estimated maximum possible yield (6 Mt predicted, estimated yield range 4-8 Mt). The Shrimp test device was basically a scaled down version of the Runt device tested in Castle Romeo, but with partially enriched lithium as fuel. Its weight was a comparatively light 23,500 lb, and it was 179.5 in long and 53.9 in wide. The fuel consisted of 37-40% enriched lithium-6 deuteride encased in a natural uranium tamper. 10 Mt of the yield was from fast fission of the tamper. The Shrimp also tested light case design, substituting an aluminium exterior case for the steel used in the Sausage (tested in Ivy Mike). It used a RACER IV fusion boosted primary. The reason for the unexpectedly high yield was due to the "tritium bonus" provided by the lithium-7 isotope which made up most of the lithium. This isotope was expected to be essentially inert, but in fact it had a substantial reaction cross section with the high energy neutrons produced by tritium-deuterium fusion. When one of these high energy neutrons collided with a lithium-7 atom, it could fragement it into a tritium and a helium atom. Tritium was the most valuable fusion fuel, being both highly reactive and causing extremely energetic fusion, so this extra source of tritium greatly increased the weapon yield. 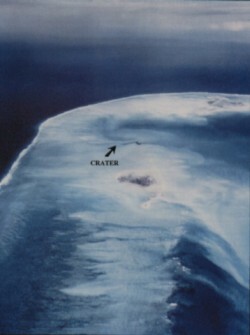 The Bravo crater in the atoll reef had a diameter of 6510 ft, with a depth of 250 ft. 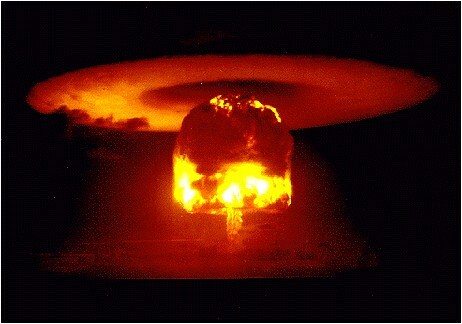 Within one minute the mushroom cloud had reached 50,000 feet (15 km), breaking 100,000 feet (30 km) two minutes later. The cloud top rose and peaked at 130,000 feet (almost 40 km) after only six minutes. Eight minutes after the test the cloud had reached its full dimensions with a diameter of 100 km, a stem 7 km thick, and a cloud bottom rising above 55,000 feet (16.5 km). The Bravo test created the worst radiological disaster in US history. Due to failure to postpone the test following unfavorable changes in the weather, combined with the unexpectedly high yield and the failure to conduct pre-test evacuations as a precaution, the Marshallese Islanders on Rongerik, Rongelap, Ailinginae, and Utirik atolls were blanketed with the fallout plume. They were evacuated on March 3 but 64 Marshallese received doses of 175 R. In addition, the Japanese fishing vessel Daigo Fukuryu Maru (Fifth Lucky Dragon) was also heavily contaminated, with the 23 crewmen receiving exposures of 300 R (one later died - apparently from complications). The entire Bikini Atoll was contaminated to varying degrees, and many operation Castle personnel were subsequently over-exposed as a result. Personnel in the firing bunker on Nan Island were trapped for a time when external radiation levels reached 250 roentgens/hr an hour after the shot. After this test the exclusion zone around the Castle tests was increased to 570,000 square miles, a circle 850 miles across (for comparison this is equal to about 1% of the entire Earth's land area). 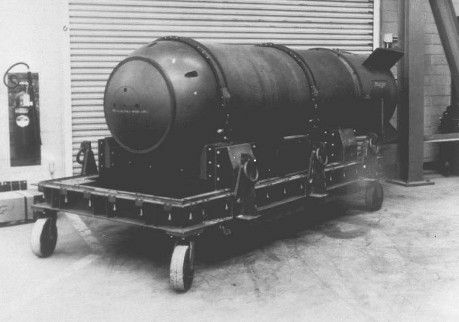 Shrimp was used as the basis for the Mk-21 bomb, the weaponization effort beginning on 26 March only three weeks after Bravo. 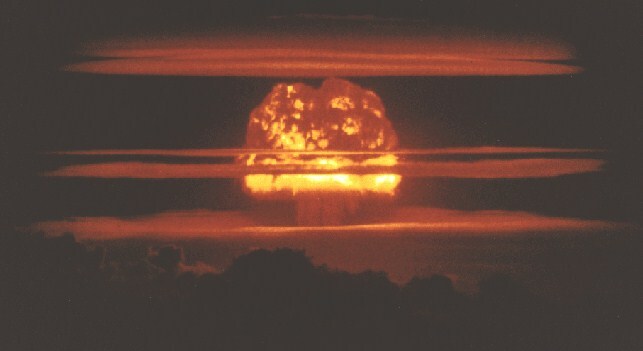 Design stabilized in mid-July 1955 with a projected yield of 4 megatons (subsequently tested at 4.5 megatons in Redwing Navajo, 95% fusion, 11 July 1956). Quantity production began in December 1955 and ended in July 1956 with 275 units being produced. The Mk-21 weighed about 15,000 lb; it was 12.5 ft long, and 56 in. in diameter. During June-November 1957 it was converted to the Mk 36 design. The Shrimp device in its shot cab. 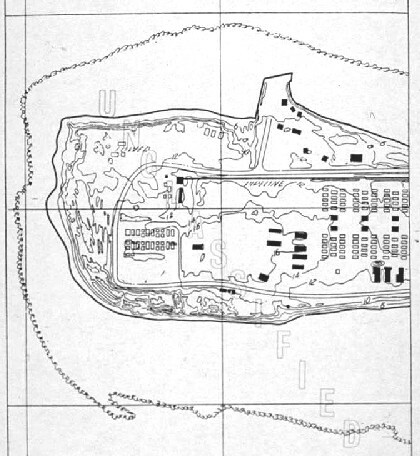 Site 20, the one acre artificial island holding the Bravo shot cab, was connected to nearby Namu island (visible at top of picture) by a 2900 foot causeway across the reef. The array of dark towers support mirrors that reflected images of the early stages of fireball growth to other nearby islands. This picture was taken from RB-26 at about 40,000 ft. a few minutes after zero hour. 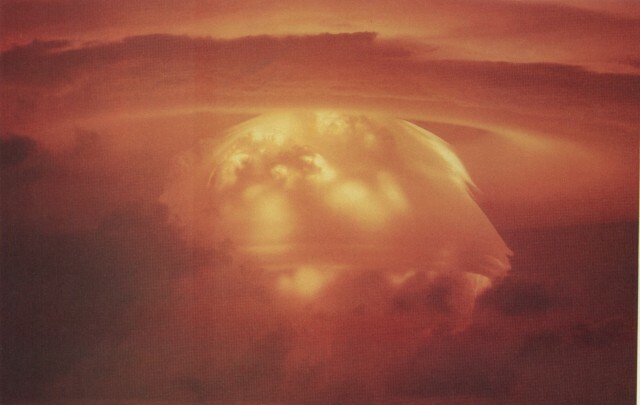 The fireball/mushroom cloud had quite a variety of condensation structures associated with it. At various stages of its life it had 4 condensation rings, 3 ice caps, 2 skirts, and 3 bells. In this picture 3 ice caps and 2 rings are seen. Contour lines show the cumulative radiation dose in roentgens (R) for the first 96 hours after the test. Like Bravo, Romeo's explosive power far exceeded original projections - in fact it did so by an even larger factor, almost tripling the best guess yield. 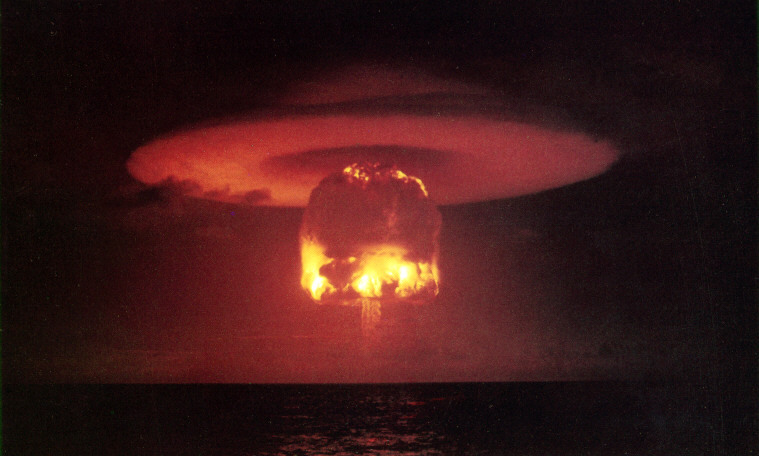 At 11 megatons Romeo was the third largest test ever detonated by the United States. The original yield estimate for this test device, known as Runt (and later Runt I) was only 4 megatons (with a range of 1.5-7 Mt). As the large uncertainty range indicates, the performance of this device was highly uncertain. The reason for this was that it used inexpensive and abundant unenriched natural lithium (7.5% Li-6) in the lithium deuteride fusion fuel. In fact as late as October 1953, Los Alamos was considering not even testing this device. The decision to include it was thought to be a crap-shoot to see if this cheap fusion fuel would be useful. The spectacular results of Bravo - which was a scaled down version of the Runt device with partially enriched lithium fuel - caused the expected and maximium yields for Runt to be doubled to 8 and 15 Mt respectively. It also led to Runt being moved up in the test schedule to the second shot rather than the sixth. Runt I was a proof test of the Mk-17 bomb (which was deployed as the emergency capability EC-17 in a matter of months). 7 Mt of the yield was from fast fission of the natural uranium tamper. Romeo was the first nuclear test conducted on a barge. Since high yield thermonuclear tests were blowing vast holes in the reefs at Bikini and Enewetak this was imperative - otherwise the U.S. test program would soon run out of islands. 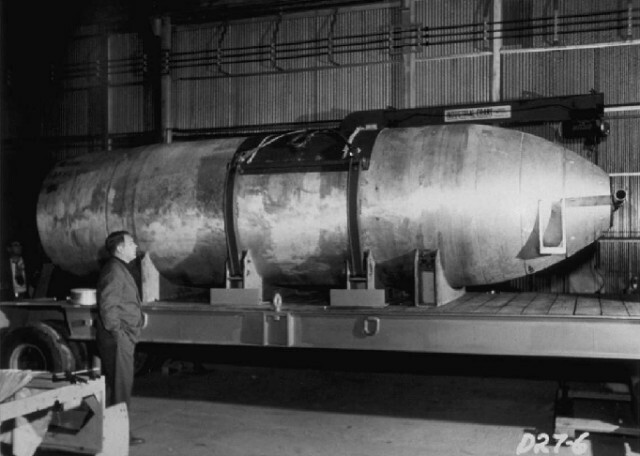 The Runt I test device weighed 39600 lb., and was 224.9 inches long with a diameter of 61.4 inches. Click here for a much bigger Runt (640x474, 77 K)! Koon was the first thermonuclear device to be designed by UCRL (now Lawrence Livermore), and was the last weapon design on which Edward Teller directly worked. 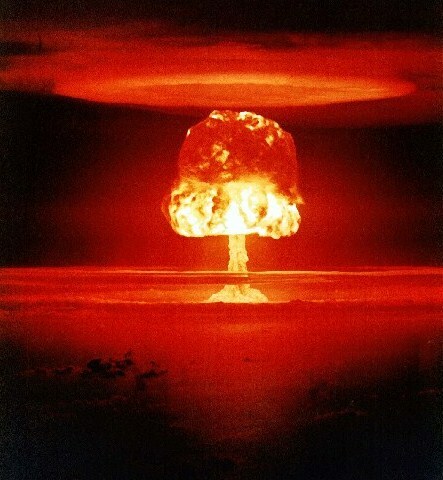 It was a fizzle - with a predicted yield of 1 megaton its actual yield was only 110 kt. Of this, 100 kt was from fission (almost entirely due to the primary), only 10 kt of energy was contributed by fusion reactions. The test device was name Morgenstern ("morningstar"). It had a somewhat more complex internal design than the Los Alamos devices and was intended to break new ground in weapon design. Diagnostics indicated an unexpectedly long time delay between the primary firing and the secondary ignition. Reportedly this was due to a simple design flaw - the neutron flux from the primary had pre-heated the secondary leading to poor compression. Other devices tested in Castle contained boron-10, which may have served as neutron shield to reduce this pre-heating effect. In any case, the failure of this dry fueled design also led to the cancellation of the test for its cryogenic sister device - the Ramrod. Below is a map of Eninman Island before and after the Koon shot. The crater was 990 feet wide and 75 feet deep. Remember, Koon was a fizzle! A successful shot would have obliterated most of the island. The Alarm Clock device (completely unrelated to the Sloika/Alarm Clock weapon design) was a prototype of the EC-14, a dry fuel thermonuclear weapon that had already been deployed by the U.S. on a emergency basis. This weapon used 95% enriched lithium-6 deuteride fuel, which was expensive and scarce at the time and limited the numbers that could be deployed. 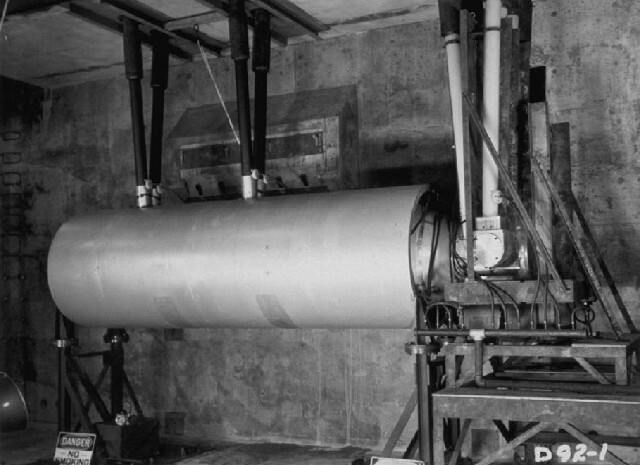 The Alarm Clock was 61.4 inches wide, 135 inches long (for the nuclear system - the total length was 151 inches), and weighed 27,700 lb. It used the RACER IV primary. 5 Mt of its yield was due to fission (72.5%). The test left a 300 foot wide, 90 foot deep crater in the lagoon bottom. This device - designated Runt II - was a proof test of the TX/EC-24, the sister design of the Runt I TX/EC-17 which was fired in Romeo. Both weapons had identical casings, external appearance, and weight. The principal difference was the choice of thermonuclear fuel. While Runt I used natural lithium (7.5% Li-6), Runt II used partially enriched lithium (37-40% Li-6, the same as the Shrimp device tested in Bravo). 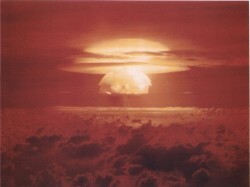 Runt II was included in the test schedule following the extremely successful test of Runt I, and the withdrawal of the Ramrod and Jughead devices from the series (the first due to the failure of its sister device Morgenstern; the second due the fact that cryogenic weapons were now obsolete). The Runt II was (like Runt I) 61 inches wide and 225 inches long and weighed 39,600 lb. It used the RACER IV primary. As might be expected from the substitution of more tritium-fertile enriched lithium, the yield of Runt II exceeded Runt I. Its predicted yield was 9.5 Mt (range 7.5-15 Mt); the 13.5 Mt actual yield was the second highest of any U.S. test ever. The substitution led to a yield increase of 2.5 Mt - entirely due to fusion, this represents a 63% increase in fusion output (from 4 to 6.5 Mt). This fusion yield was the largest such yield of any device tested up to this time, larger than any Castle test, and set a U.S. fusion yield record that held until the Hardtack Poplar test in 1958. 7 Mt of its yield was fission (51.9%), the same as for Romeo. The Zombie device tested in Nectar was a prototype of the TX-15 lightweight thermonuclear weapon. This bomb was a transitional design between fission bombs and the classic conception of a hydrogen bomb. The Zombie began its conceptual existence as a radiation imploded fission bomb with a yield in the range of hundreds of kilotons, similar to Stanislaw Ulam's original conception of using one fission bomb to compress another. The idea of making the outer case of the secondary out of fissile material (enriched uranium) rather than natural uranium was retained, but the design evolved to include fusion fuel (lithium deuteride and tritium) to boost its yield. The final result is basically a radiation imploded fusion boosted fission bomb. The difference between this approach and the other two stage thermonuclear systems tested in Castle was that the requirements for compression are relaxed. The other thermonuclear systems needed to achieve efficent compression of the low density fusion fuel to achieve extremely high densities so that a rapid equilibrium burn would occur when the fission "spark plug" in the center ignited it. Although most of total energy release might be due to fission, it was fast fission of ordinary uranium driven by the fusion produced neutrons. The Zombie - by using a secondary case made of highly enriched uranium (though perhaps not quite "weapon grade") - would become supercritical through a much less demanding compression process. The rapid energy release through the fission chain reaction would drive the whole system to thermonuclear temperatures, and due to the strong heating the fusion fuel inside could burn without nearly as much compression. This Zombie was not as cheap as the other thermonuclear systems tested in Castle due its use of enriched uranium, enriched lithium, and tritium; but it could be made smaller and lighter than any of them. It was also a relatively low risk design, the fission explosion of the secondary being a very robust process. The yield of Zombie was the closest to original predictions of any of the other Castle devices, differing only by a negligible 6%. Nectar obtained 80% of its energy release from fission (1.35 Mt), the highest percentage of any of the Castle devices (neglecting Koon - which didn't work). The Zombie device was 34.5 inches in diameter, 110 inches long, and weighed 6,520 lb. It used the COBRA primary. The mushroom cloud top reached 71,000 feet. Below is the deployed version of the Mk-15 bomb (this is not the actual Zombie test device). Below is a picture of the TX-16 JUGHEAD, the direct descendant of the SAUSAGE fired in Ivy Mike. 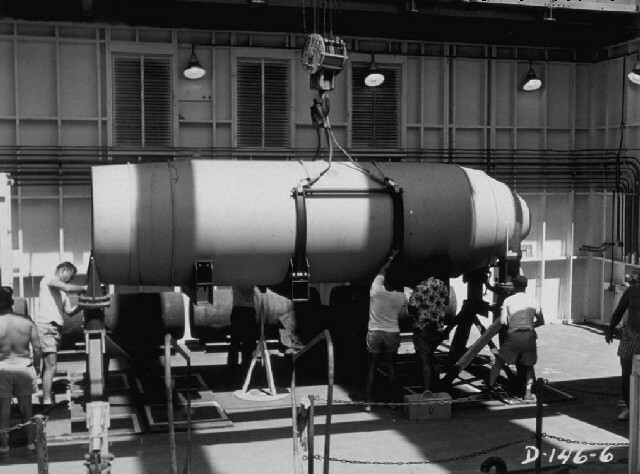 This cryogenic weapon system, using liquid deuterium fuel, was actually fielded - one of the first two thermonuclear weapon systems ever to reach deployment. After the stunning success of the solid fuel SHRIMP, this system became instantly obsolete and was never tested.